Southerndown is a small village at the western end of the Vale of Glamorgan approximately 5 miles from Bridgend. It consists of mainly residential housing and holiday lets, a pub and a small restaurant. Approximately 1/2 mile from the village is the villages crowning glory, the stunning beach at Dunraven Bay. Since 1972 the coastline has been designated a "Heritage Coast" and is part of the Southerndown Coast SSSI. 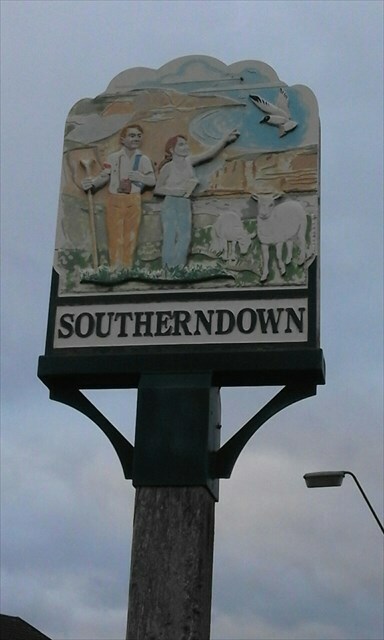 Further information about Southerndown and the surrounding area can be obtained from the Southerndown Village web page. At the listed coordinates you will see the Southerndown village sign a few yards away. On the nearby telegraph pole (next to the sign for the beach) there are a series of numbers - black in a yellow background. Parking is available close to both the listed coordinates and the final cache location. Please bring your own pen. The final cache should be wheelchair accessible but retrieval may require some assistance. Village signs is a series of caches based on the ornate signs that depict the heritage, history and culture of the villages that put them up (normally on the village green!). The signs can be made of different materials from fibreglass to wood, from forged steel to stone. They can depict anything from local industry to historical events. The tradition probably stated in Norfolk or Suffolk and has now spread across most of the country.